Ted Dintersmith’s book ‘What School Could Be’ is a culmination of one year travelling across every State in the US to visit over 200 schools and conduct a thousand meetings with educators, teachers, students and concerned parents. The subsequent film ‘Most Likely To Succeed’ focused on one school in particular, High Tech High in San Diego that is pioneering a new education model where teachers are on 1 year contracts and lessons are flexible cross-curricular project-based learning, students have autonomy over their studying with no text books or homework and parents are pleased with results so far, but still worry about long-term outcomes of college acceptance and job prospects. “Standardised testing is for the convenience of bureaucrats and the workplace of 100 years ago, not for young people realising their full potential in a fast-changing world. The growing impact of artificial intelligence is making traditionally safe and secure careers, for example in medicine and law, completely redundant. That whole model of ‘get into College and everything will be well’ has always been the low-risk strategy and letting kids take on projects they really care about and get really good at and can be proud of, has been high risk – but it really isn’t now. In my earlier career in venture capital we were dealing with a lot of startups that dominate the business world now. And the more that the world becomes driven by innovative, creative and passionate young adults, the more the model that says ‘just do this stuff that’s assigned, just plow through it, don’t question it’. It’s not that it’s just not as good as it could be, it actually will damage their prospects – and parents need to know that”. Stephanie McConnell is the principal of Lindfield Learning Village, a revolutionary new state school that opened 13 days ago in Sydney’s north and is ‘stage not age’ project and design centered learning. With over 28 years as a teacher and principal Stephanie expressed her passion to do education better. “To prepare students for real-world situations of collaboration, communication and critical thinking. And to experience failure in a safe environment, so students can learn and grow. Peter Hutton is the Director of the Future Schools Alliance supporting transformational change in schools across Australia. Peter has extensive experience in the education sector with strengths in transformational insights and HOW to implement that change effectively in schools. 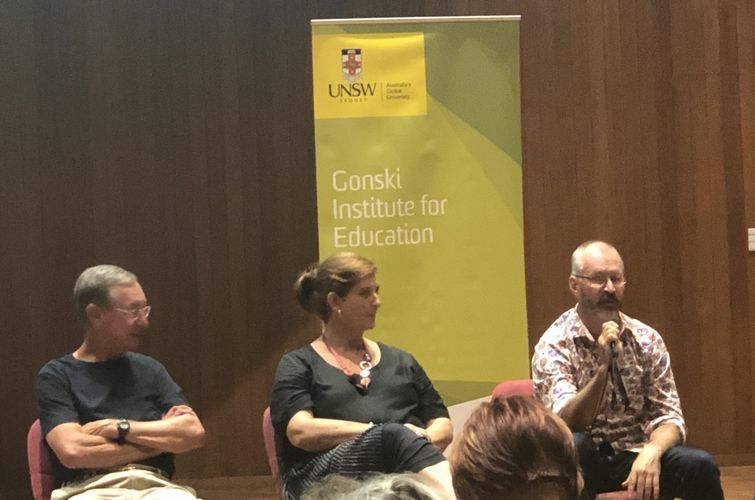 Peter was the principal at Templestowe College, who turned the very dysfunctional and failing school with 286 students and no future into a personalised learning environment that now has over 1200 students. They employ 10% of students to work within the school, in roles from canteen to grounds maintenance. Students have created over 80 businesses, from ideation to execution. There are no year levels, no bells and everyone is on a first name basis. I was on a call with Rita Ferrandino recently, Rita is reputed to be one of the most effective strategists and VC fund operators in the education community. When asked what would be a competitive advantage for an EdTech company trying to enter the US education marketplace, she said, “Social and Emotional learning projects.” I was pleased to hear this, since that is exactly what Bookform projects are designed to do. Bookform is an online tool for students to collect stories and photos from their family and community, using voice-to-text and collaboration, to create printable digital books. Bookform projects are not solely about creating a book, but more about scaffolding kids to communicate, ask questions, listen to responses, social etiquette, learning about their family as people and developing vital skills for life. The finished book product can be monetized and raise funds for the school, and is something the student and their family can treasure for many generations. Are you an educator interested in Social & Emotional learning projects for your students?